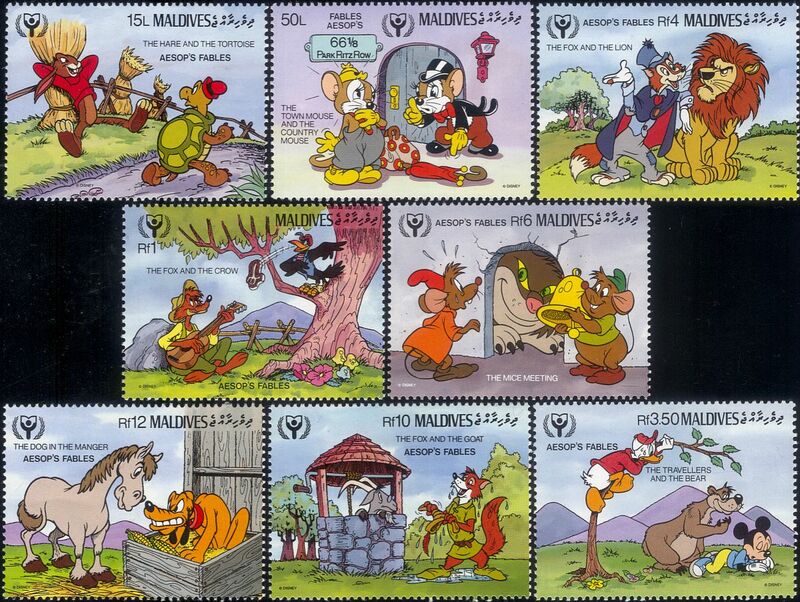 Maldives 1990 International Literacy Year : Disney's Aesop's Fables 8 value set featuring "The Hare and the Tortoise", "The Town Mouse and the Country Mouse",, "The Fox and the Crow",, "The Travellers and the Bear",, "The Fox and the Lion", "The Mice Meeting", "The Fox and the Goat" and "The Dog in the Manger" - in superb u/m (mnh) condition (Stanley Gibbons 2019 Catalogue Value £14) - excellent country, Disney, ILY, mickey, minnie, donald, goofy, foxes, bears animation, cartoons, books, literature, writing, stories, tales thematics. If you cannot find the specific stamp set or thematic/topic you are looking for either here in my shop or at the brumstamp stamp shop on eBay http://stores.shop.ebay.co.uk/The-Brumstamp-Stamp-Shop please do not hesitate to contact me. Enjoy browsing and shopping. Andrea!